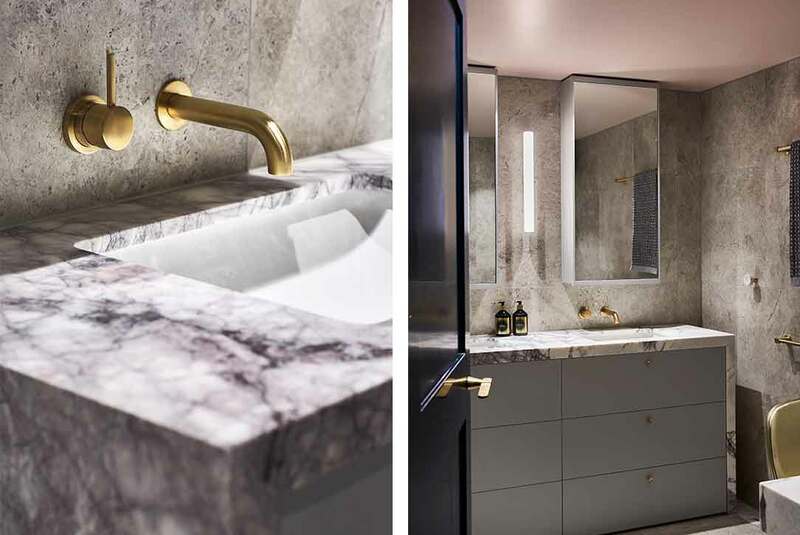 The Melburnian II was another complete renovation of a smaller residential apartment in the same complex, following a very successful penthouse renovation for the same clients. 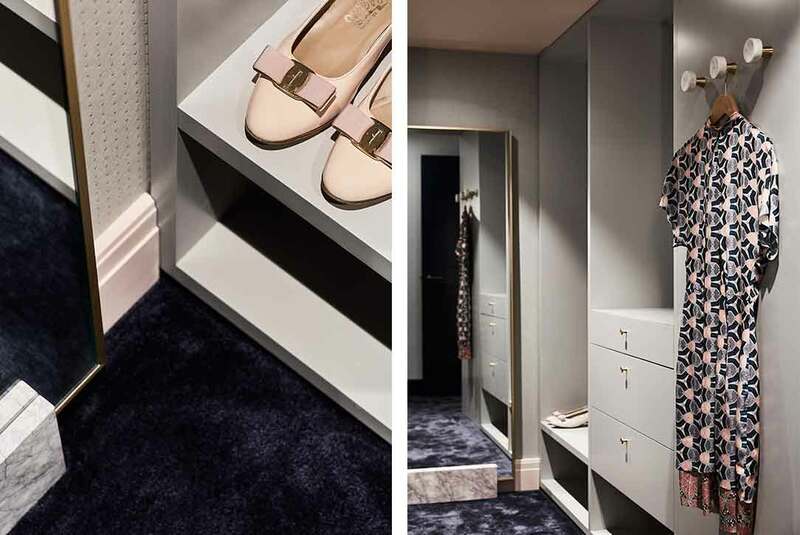 Acknowledging that good things can very often come in small packages, we borrowed from the idea of a jewellery box to create a compact and fabulous space filled with many special elements. 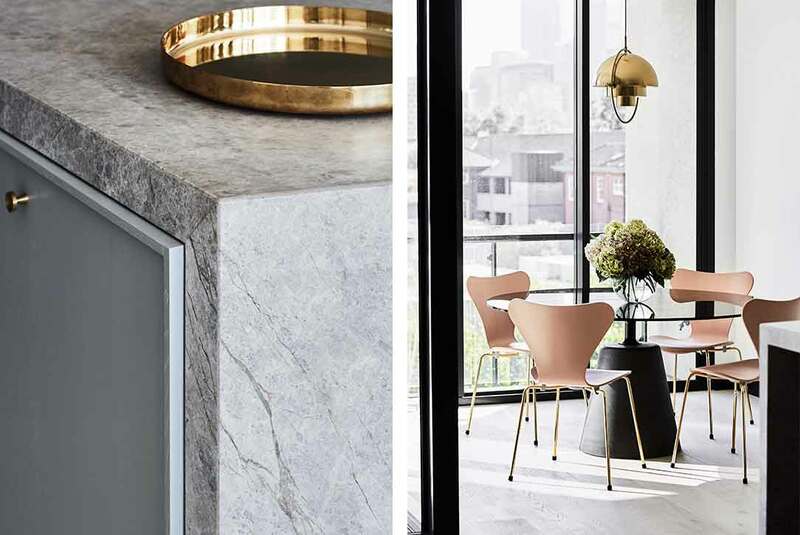 Opening a jewellery box is always a moment of discovery (or rediscovery), this same element of fascination was injected throughout this home, with lots of hidden surprises concealed within the apartment’s surfaces. Details reflect the delicate shades and textures of a felt-lined treasure trove, with wallpaper lining the walk-in robe in delicate grey and pink. The bathroom is a soft cocoon with a delicate pink painted ceiling, accented with black-veined pink marble. The jewel itself is a bevelled island bench in the kitchen in grey marble, the diamond shape giving it a gem-like form. The filigree detail of jewellery box latches and hinges has also found its way into the design, with gleaming, metallic features. 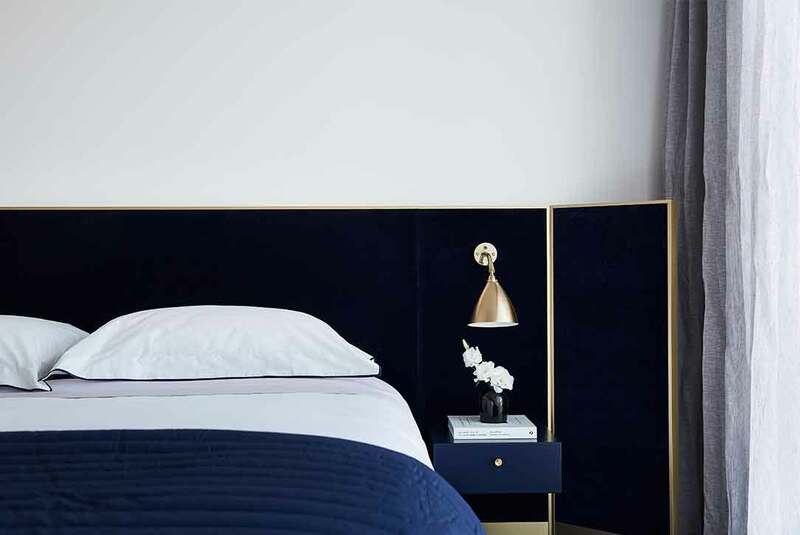 The colour palette has been built around the judicious application of striking, bold tones: navy blue carpets, doors and skirting provide warmth and drama without constraining the volumes. 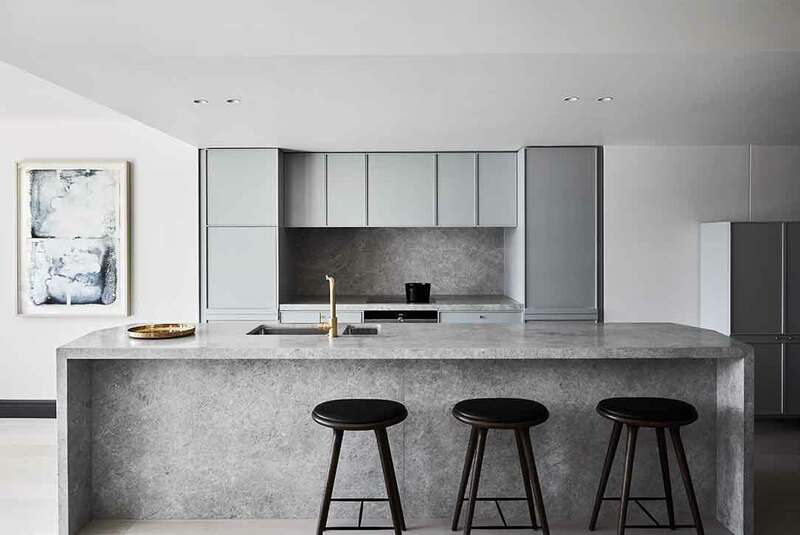 Opening a jewellery box is always a moment of discovery (or rediscovery), and Studio Tate injected that same element of fascination throughout this home, with lots of hidden surprises concealed within the apartment’s surfaces. Details reflect the delicate shades and textures of a felt-lined treasure trove, with wallpaper lining the walk-in robe in delicate grey and pink. The bathroom is a soft cocoon with a delicate pink painted ceiling, accented with black-veined pink marble. Appliance cupboards have grey Corian lining, while other drawers, shelves and cupboards are lined in navy and pink accent colours. The jewel itself is a bevelled island bench in the kitchen in grey marble, the diamond shape giving it a gem-like form. The filigree detail of jewellery box latches and hinges has also found its way into the design, with gleaming, metallic features. 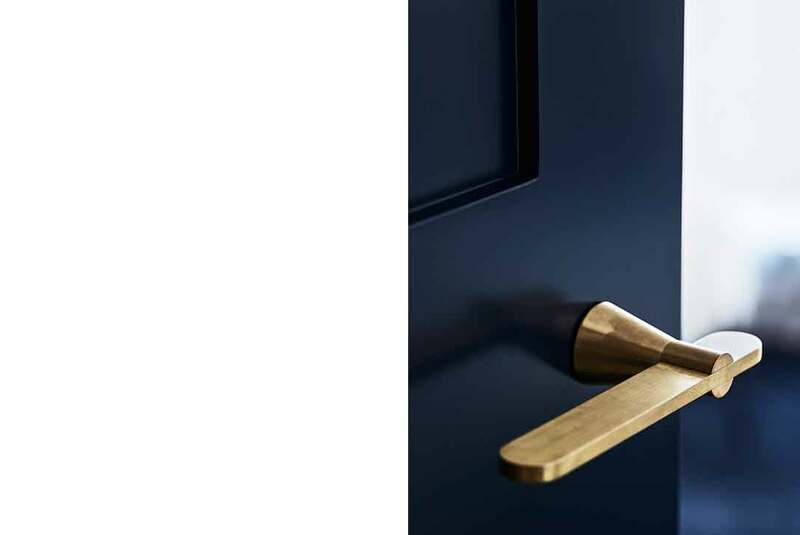 Brass handles become sculptural objects in themselves, and this finish has also been used to make a statement with hinges, door levers and joinery pulls in various rooms. 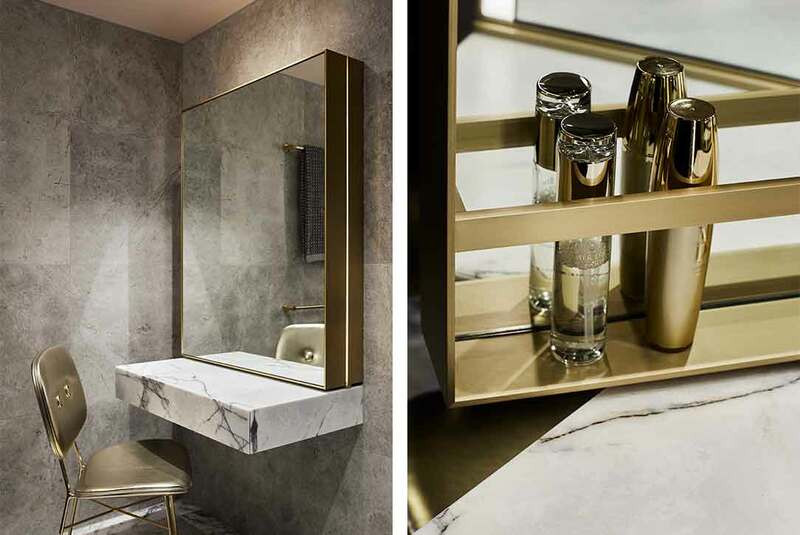 The adjustable make-up station mirror is also edged with brass trim, with brass details for storing cosmetics and fragrance. A hinged bedhead also brings in the comforting glow of this metal. 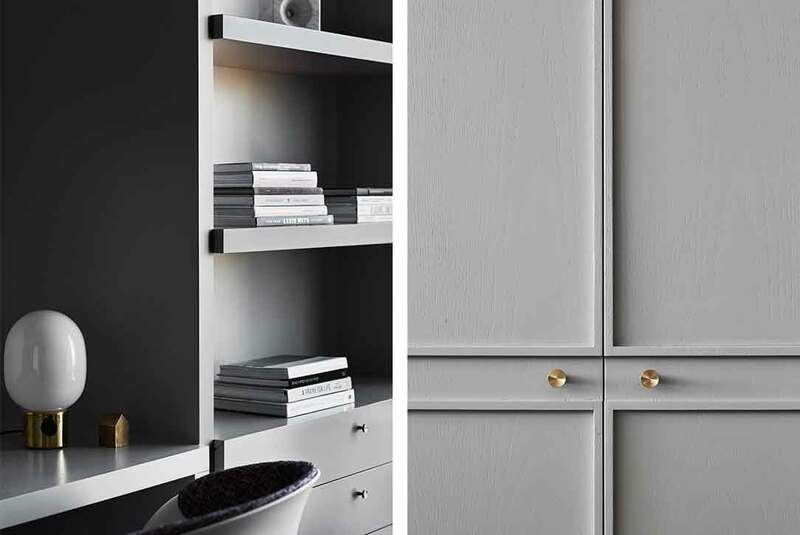 The colour palette has been built around the judicious application of striking, bold tones: navy blue carpets, doors and skirting provide warmth and drama without constraining the volumes.